Growing up in Louisiana, Mardi Gras seemed like a magical time when adults dressed up in colorful costumes, parades filled every street, and leftover plastic beads and candies were evidence of the spectacles. Best of all, I was allowed to eat my weight in King Cake. To a five year old, King Cakes are like one gargantuan filled doughnut; deep-fried and drenched in icing so thick it would make my dentist pass out. There were many in depth conversations with peers on how the diminutive, plastic baby Jesus did not melt whilst being fried. The verdict was that the filling created a magical gooey force field around Jesus to protect him. That was enough to suffice my curiosity as it made complete sense. As I now know, the cakes are baked, not fried and the plastic babies are inserted after the cake has baked and cooled… but I still like my childlike version better, and I am still convinced that the filling has magical powers. Ahem. 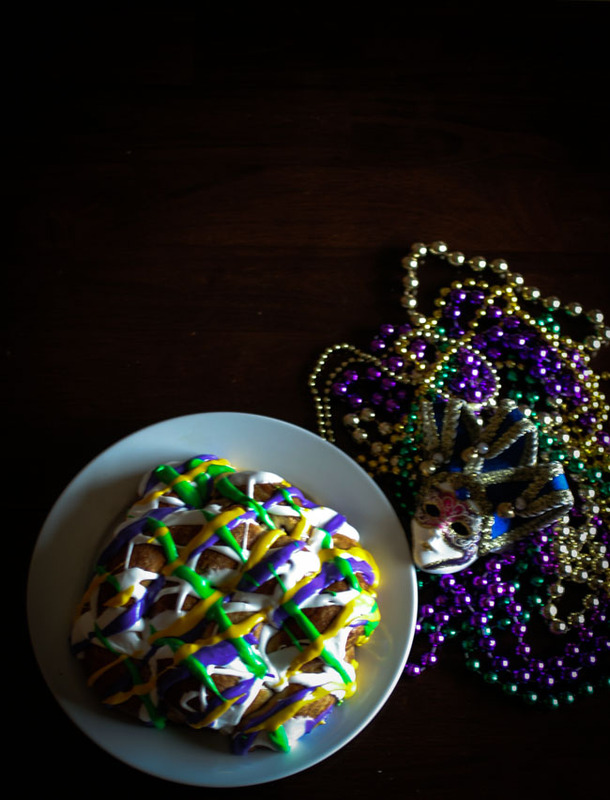 Here is my grownup version of King Cake, dough made by hand, meticulously braided and baked until beautifully golden brown, adorned with the traditional colors of Mardi Gras. 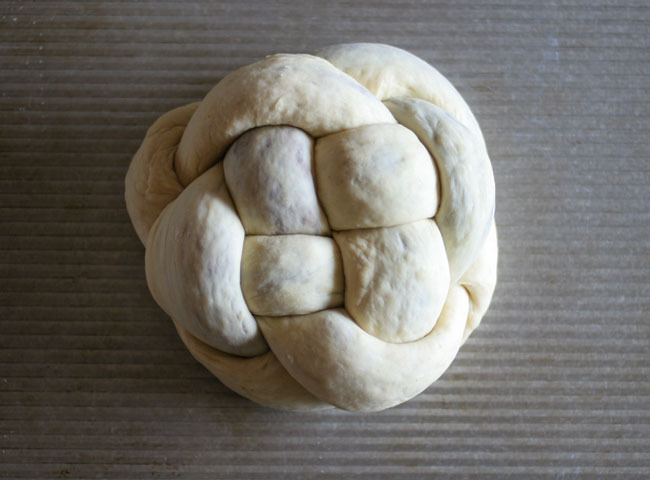 I also included step-by-step photos in the process of rolling out the dough, filling it and braiding it. I hope the photos help! Combine ½ cup of brown sugar and 1 tablespoon of ground cinnamon in a bowl. Set aside. Once the dough has risen, punch it down and divide the dough in half. 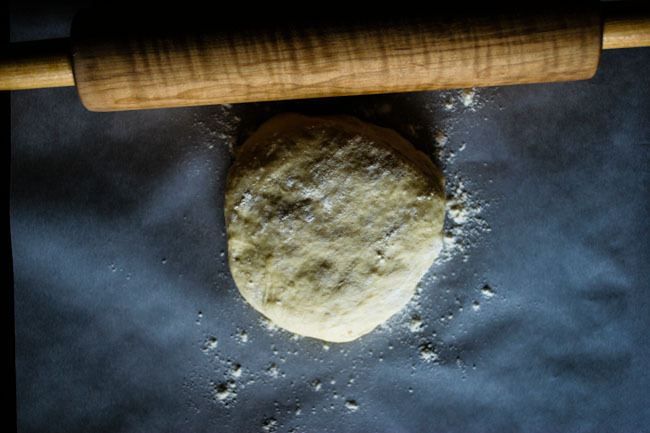 On a lightly floured surface, roll the dough out until thin and slightly rectangular. Lightly brush the dough with melted butter, leaving a 2-inch border around the edges. Sprinkle half of the filling onto the dough. 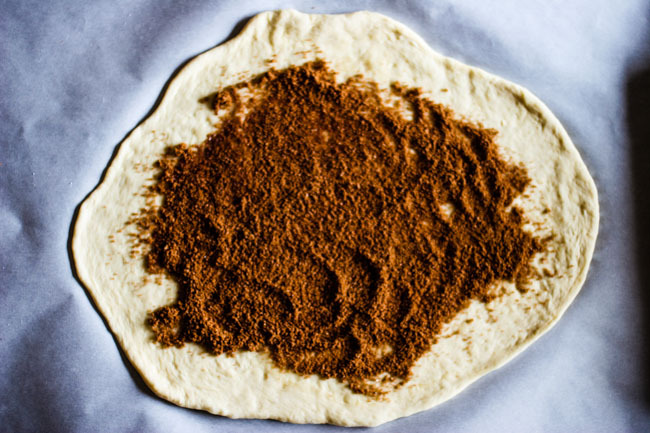 Roll the dough up tightly, longwise, beginning with the side closest to you (this step is a lot like making homemade cinnamon rolls.) Once the dough is in one long, snake-like shape, begin rolling the dough out with your palms gently until the length reaches about 2 feet. Cut the dough in half and continue with the other half. 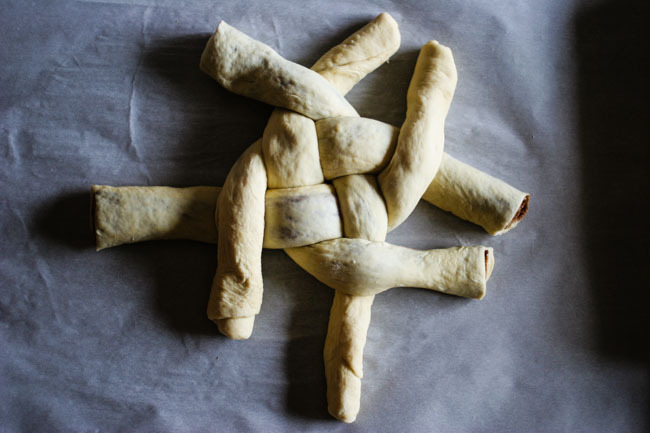 Once you have 4 equal pieces of rolled dough, place 2 pieces of dough side by side, and then place the remaining dough in a tic-tac-toe format. 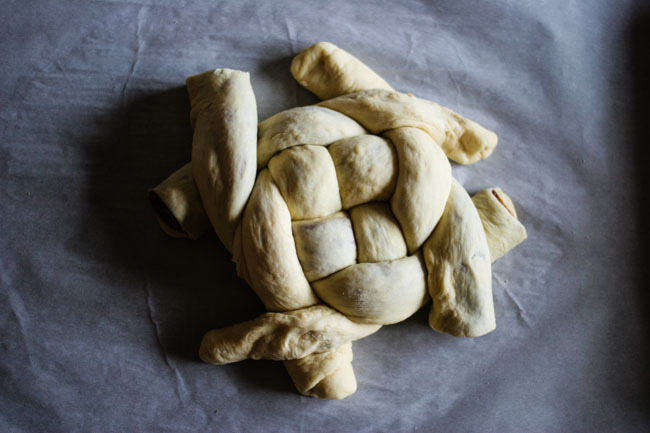 Take the pieces of dough that are coming from the underneath of the center and cross it with the piece of dough to the right of it. Then, take the pieces that are now on the underneath and cross them with the piece to the right of it. Continue until you run out of dough and tuck the remaining stragglers on the underbelly of the dough. Place dough onto a baking sheet lined with parchment paper, lightly brush with egg was and let rise in a warm spot for 1 hour. 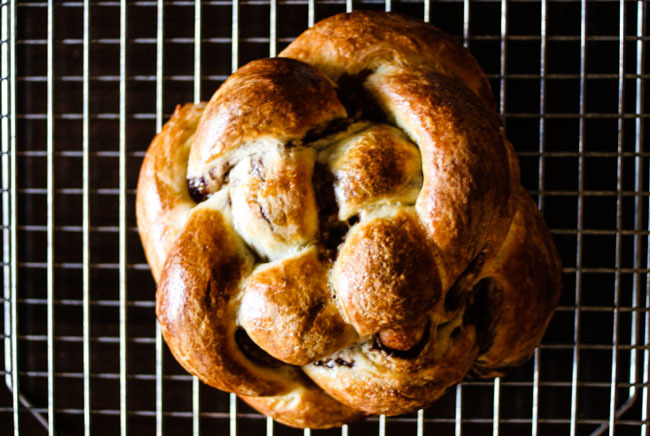 In an electric mixer fitted with a whisk attachment, whisk all ingredients together until the mixture becomes glossy and stiff, about 1-2 minutes. Divide the icing into 4 equal amounts in 4 separate containers. In one container, place purple paste into the icing and stir to combine. The intensity of the icing really depends on your taste, so you can make the colors as rich or as subtle as you like by adding more or less of the coloring paste. Continue the same way with the green and yellow, making sure the last container is left white. Carefully fill the colored icing into individual sandwich-sized Ziploc bags. Push all of the icing to one side of the bag and snip the tip off with scissors. Decorate the king cake anyway you wish (just make sure that you sneak the baby into the cake before you ice it, then you can cover up your tracks with the icing!) I usually start with white as a base, then purple, green and finish with a pop of yellow! Have fun with it! Yum!! I want one now…. Woohoo!! Delicious, I can’t wait till you add the blueberry filling, you a pro! Thanks! Add that to the list next week! I will make one tomorrow with my 6yr.old. He loves king cake!!! Thanks amber! Keep up the good work! Thank you so much for the encouragement! Y’all have fun! Thank you! I thought it was something a little different than the traditional king cake! I can make them all year round to keep the spirit alive! And now you can too!